Home Case Studies Molly B.
prednisolone tablets (1/2 tablet = 2.5mg) each evening. Zantac Liquid (0.3ml twice daily) as required. 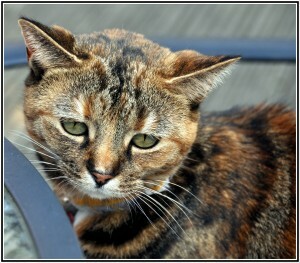 Prior to Molly’s illness she was a petite cat weighing 3.2kg, 7 lbs, but was a little chunky for her frame. She always had a good appetite. Pre-illness she was eating a mixture of Felix As Good As It Looks (Purina) wet food and Royal Canin Feline Sensitivity Dry Duck. (NB. The RC Duck had been prescribed for my existing cat who occasionally suffered from bouts of diarrhea). In February 2014 Molly had an episode of vomiting which looked to contain some blood so we took her to the vet. The vet diagnosed a hairball and prescribed Catmalt paste. About a week later she vomited up a roundworm so I gave her some Profender spot on worming treatment. Prior to this she had regular monthly worming and flea treatment (Advocate). From February to May 2014 Molly suffered from bouts of vomiting every few weeks. Sometimes quite soon after eating, other times several hours later. She would tend to vomit about 3 times a day, first vomiting food, then later bile. She would go off her food for a day or two. In May 2014 things rapidly progressed and she was vomiting every few days. She would smack her lips, heave several times and then vomit. She vomited a small hairball once, but usually vomited food and grass. In mid-May a blood test showed increased ALT of 250 (normal range 60-120). Her bilirubin was also slightly increased, and her temperature was normal. She was prescribed Baytril antibiotics for a suspected infection, however we were unable to give her the tablets as she bit me badly, so she had a shot of Convenia (antibiotic) and she seemed to perk a bit up after this. She continued to have regular episodes of vomiting and in mid-June 2014 had an ultrasound and PLI blood test. She had lost about 500g of weight at this stage. There was some thickening of the small intestine and a small white area near the bile duct. The blood tests showed the ALT was now in the normal range and so was the bilirubin, but her white blood count was slightly raised. There were no signs of pancreatitis or any liver disease. Her protein was slightly low but this was probably as a result of not eating due to nausea. I tried swapping her food to Applaws wet and Thrive wet, but she continued to vomit so on 14th June Molly started prednisolone 2.5 mg each evening and was given an injection of Cerenia (anti-nausea medication). Her temperature remained normal. We gave the pred crushed into some cat yogurt. Molly continued to have episodes of vomiting which followed a weekly pattern of vomiting then not eating for 2 days, followed by a Cerenia injection. She would start eating 2-12 hours following the Cerenia. We therefore began to get her a Cerenia shot as soon as possible after she had vomited and this was approximately once a week. We tried the Cerenia tablets (1/4 tablet) for a couple of days but this didn’t seem to have much effect so went back to the shots. She continued to lose weight. At the start of July 2014 Molly was prescribed Zantac liquid (0.3ml twice daily) to help control the nausea. This also seemed to settle her tummy which would rumble occasionally. She had lost a total of 640g (1.41 lbs.) in weight (down to 2.56kg, 5.10 lbs.) and was continuing to lose weight due to the vomiting. She was prescribed Mirtazapine (1/4 tab every 3 days), but straight after giving her this she drooled heavily and shook her head. On July 3rd we visited a specialist vet center for an endoscopy, but unfortunately the machine was broken! They re-ran her ultrasound and blood tests. Her white count remained slightly elevated at 14 (normal range 1-12) but she did not require any antibiotics. The ultrasound was normal, just slight thickening of intestines. A urine sample was taken and this was normal. The specialist vet advised that her own dog suffered from IBD and was controlled by diet alone. She therefore recommended the Hills z/d dry and gave us samples of both the wet and dry. Molly would not eat the z/d wet, but liked the dry. In mid-July 2014 Molly underwent an endoscopy. 12-14 biopsies were taken which showed some gastric necrosis near the duodenum and some inflammation of the small intestine. A diagnosis of IBD was given and we were told to continue the prednisolone daily, and Zantac as required. Her weight was now down to 2.41kg, 5 lbs. (a total of 790g, 1.74 lbs. lost). We were extremely concerned and worried we were going to lose her. We discussed options with the vet and decided that if she did not gain any weight in another week, we would go for a feeding tube in her neck. Luckily however, the combination of the prednisolone, Cerenia, Hills z/d and occasional Zantac kicked in to control the vomiting and she seemed to turn a corner, and she gained a little weight, about 70g (15 oz.). At the end of July 2014 Molly underwent her routine vaccinations. She had started to gain weight, she was up to 2.65kg, 5.13 lbs. She regularly visits the bowl and consumes the hills z/d dry of about 80g per day. Unfortunately since commencing the Hills z/d she has suffered from some soft, tan colored poops (she never had any diarrhea before the Hills), but the plus side is that she no longer vomits. She last vomited on 9th July (4 weeks ago) and has not had any Cerenia for 4 weeks. She has improved dramatically and now wants to play with her toys and is very affectionate. Having weighed her (1 August 2014) she is now at 2.99kg, 6 lbs.!!! It’s early days yet, but things are looking more positive. October 20, 2014: Molly has not vomited since July 9th. In mid-September we reduced Molly’s prednisolone to 1/2 tablet every other day and she continues to do well. She has continued to gain weight since her last weigh-in in about Aug 2014 when she was at 2.99kg (6lbs). She is now just below 3.8kg (8.4lbs) (unfortunately this does make her a bit overweight but I am hoping that we will be able to reduce the pred further in due course and that I will then be able to bring her weight down). However, after being a cat that would not/could not eat I am relieved that she is enjoying her food and is happy again. She eats Hills z/d dry, although she would still prefer Felix wet and is always trying to get her head in my other cat’s bowl. 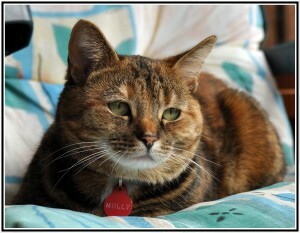 Molly is back to her boisterous self and enjoys playing with her toys and chasing her furry brother around the house. November 1, 2014: Today I gave Molly some boiled chicken. Unfortunately a few hours later Molly vomited the chicken onto the lawn. This is the first “real” food she has had since starting the Hills z/d hydrolyzed dry kibbles in July. In mid Sept we reduced her pred to every other day, but it seems too much of a coincidence that on having her first real meal she is poorly again. She seems fine in herself, is still running around and purring. January 21, 2015: Molly is no longer on prednisolone. In mid Oct 2014 we stepped it down to 1/2 tablet every other day. Then mid November reduced to 1/4 tablet every other day for 2 weeks, and by end of November she was tablet free. She is doing well so far. She has the occasional treat of a bit of smoked ham or a bit of white fish, and seems happy and healthy. October 10, 2015: Molly is doing great. Its now over a year since she was diagnosed with IBD. She is eating well (hills z/d dry) and occasional treats. No vomiting and has put on weight. October 10, 2016: Molly eats Z/d dry, plus some treats and bit of gravy/jelly from my other cats food (Felix as good as it looks/gourmet). No medications in over 20 months and has never taken supplements. no vomiting or other symptoms since 2014. No other medical problems. Now weighs approx 4.6kg/10lbs. Has lots of energy and loves playing. P.S. Hills have just “improved” z/d to add more vitamin E (to improve coat/skin conditions?). We are on our first new bag so if any problems will let you know. August 14, 2017: Molly is doing very well. She loves life and playing with her favourite toy. She’s a bit overweight (she LOVES food and purrs when eating!). She’s had no vomiting episodes since my last update, and no other signs of illness. She has hills z/d dry kibble daily, which is supplemented with felix as good as it looks in jelly, and purina gourmet in gravy, both of which we increased slowly with no signs of adverse reactions. I suspect that her former diet which included royal canin sensitivity diet kibble (SC27) – which was prescribed for my other cat – may have triggered her illness initially and without this food she is very well, although I continue to monitor her closely for any illness or adverse food reactions. Nov 2018: Molly continues to do well, she has not had any IBD episodes since 2014. She is a little overweight at around 10lb, she loves her food. She is eating hills z/d dry and also has a small portion of Felix as good as it looks in jelly (Purina) or Gourmet in gravy (Purina). She does not have any fresh/raw foods, except an occasional treat of a small portion of cooked white fish. We avoid giving her any fresh chicken due to her vomiting episode in Nov 2014. She is now a healthy, happy cat and loves playing with her toys.